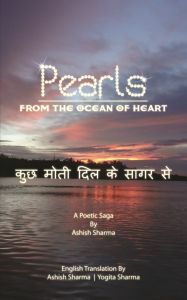 "Pearls - From the Ocean of Heart" is a unique collection of Hindi poems with English translations for everyone to enjoy. They are inspired by day-to-day events and occurrences in my life and in the world. The author has expressed his thoughts about relationships, social evils and issues, happiness and hope all in the form of poetry. The author comes from a family of academics from Patiala, Punjab. He graduated in Mechanical Engineering and later did an MBA. He then shifted to Pinjore, Haryana to work. He moved to Medan, Indonesia in November, 2012 after working for several Indian and multinational companies for about sixteen years in India. He now works as a General Manager in a multinational in Medan. He lives with his wife- Yogita (Meenu) and their two lovely children Apurva (Aru) and Abhilaksh (Lakshi).